The Alexa.RTCSessionController interface describes the messages used by Alexa to interact with endpoints capable of real-time communnication (RTC). The RTCSessionController interface supports 1-way (half duplex) or 2-way (full duplex) communication over audio and video. By using the RTCSessionController interface in your applications, Alexa customers can communicate with a visitor at their front door through their camera and intercom. For more information, see Announcing 2-Way Communication APIs. Important: Currently the RTCSessionController interface is only supported on Echo Show and Echo Spot. To communicate with a front door camera on an Alexa-enabled tablet or FireTV, use the Alexa.CameraStreamController interface. Alexa, answer the front door. Alexa, respond to the front door. Alexa, talk to my front door camera. Alexa, talk to the person at the main door. Customers can start communication with a person next to a real time communication device by talking to their Alexa-enabled device (for example, an Echo Show or Echo Spot) or by using the microphone icon when they are in live streaming mode. A minimum timeout of one minute is required. For any offer sent to your skill, you must generate an answer within six seconds. For resource considerations, you must support bundling and rtcp-mux. You use a bundle to send audio and video over the same connection to reduce the number of open sockets. To support full-duplex communication, your device must employ effective algorithms for acoustic echo cancellation (AEC) and noise suppression. To support half-duplex communication, you can use the Push to Talk feature through the typical live view scenario. Declare isFullDuplexAudioSupported as false in the discovery response. For Interactive Connectivity Establishment (ICE) candidates, you can use either UDP or TCP but you must use IPv4. The RTCSessionController communication is shown in the following signaling diagram. "key4": "Do not use to maintain endpoint state"
Initiate a real-time communication session with a front door device. "value" : "<SDP offer value>"
The directive to connect an RTC session. The payload for this message contains the identifier for the RTC session, received from the original InitiateOfferWithSession directive. The directive to disconnect an RTC session. The payload for this message contains the identifier for the RTC session, received from the original InitiateOfferWithSession directive. 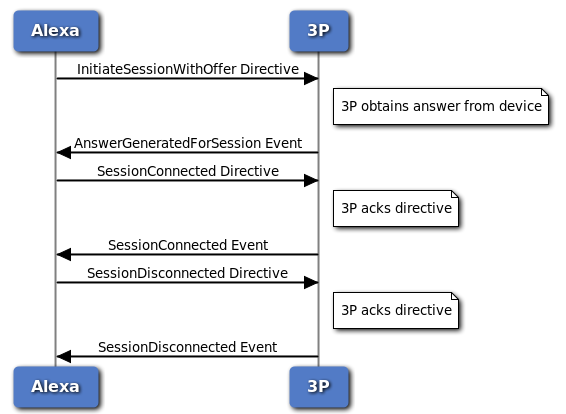 If the InitiateOfferWithSession directive was successfully handled, you should respond with a AnswerGeneratedForSession event. The payload for this message contains an SDP answer. "value" : "<SDP answer value>"
If the SessionConnected directive was successfully handled, you should respond with a SessionConnected event. The payload for this message contains the identifier for the RTC session, received from the original InitiateOfferWithSession directive. If the SessionDisconnected directive was successfully handled, you should respond with a SessionDisconnected event. The payload for this message contains the identifier for the RTC session, received from the original InitiateOfferWithSession directive. The RTCSessionController interface uses the Session Description Protocol (SDP). For more information, see Session Description Protocol (SDP). Note: Each media track has a set of Interactive Connectivity Establishment (ICE) candidates. The example shows ICE candidates of type host. You should reply with an error if you cannot complete the customer request for some reason. For more details, see Alexa.ErrorResponse. Alexa.DoorbellEventSource An endpoint that is capable of raising doorbell events.